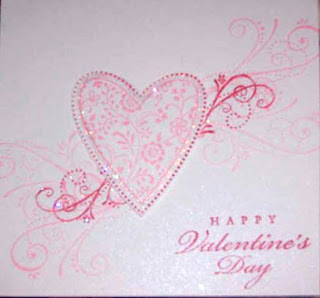 This is a very simple but elegant Valentine's Day card. This can easily be converted to an Anniversary or Wedding card bu substituting other colors. Simply ink the larger swirls from the Priceless set in Pretty In Pink and stamp. Ink the smaller swirl in Real Red and stamp. Add glitter to the red swirls where desired. Ink the heart from the Always set in Pretty in Pink, then use the Real Red marker to literally color, line the "dotted outline" on the actual stamp. Then stamp it on Shimmery White scrap paper. Add glitter to the outline of the heart or where desired. Then cut out the hear and adhere it to the card with Dimensions.